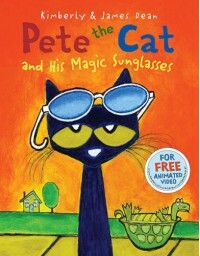 Pete the Cat and His Magic Sunglasses is another book by James Dean that captivates readers. Things do go as planned for Pete this time and he's all grumpy. However, when he runs into a friend his frown is turned upside down with a pair of sunglasses. The day looks a lot happier with his new sunglasses. When he comes across another friend having a bad day, he can't wait to share his sunglasses! I feel this book is great to use with grades kindergarten to 4th grade. It promotes a positive attitude and helping others to do the same. I firmly believe you can choose to be happy and have a good day. I would definitely use this book in my future classroom. After reading the book, I would ask the students how they could change things around if they or a friend are having a grumpy bad day. I would have them break them up into small groups and have them make a card or picture for someone in class (assigned by teacher so everyone gets one) to make their day seem a little brighter.